In the year to end November 2017 new build house prices rose on average by 4.8% across the UK which is down on last year’s figure of 6.1%. If Greater London is taken out of the calculation and we take a crude average of the remaining regions, then the change is less pronounced with average house price growth of 4.2% compared to a figure of 4.4% last year. 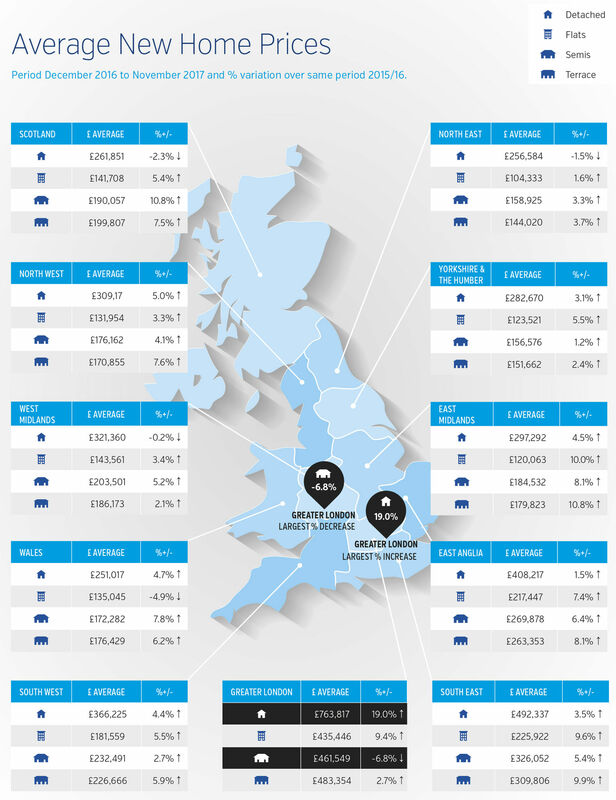 Looking across the regions it can be seen that the roll out of the housing market recovery has continued and some sustained price rises are now evident in all regions. But whilst all regions are now seeing some evidence of house price growth, the recent hot spots of Greater London, the South East and East Anglia are now seeing a slowing rate of growth. In line with other commentaries, Greater London is no longer the leading region. Indeed the relatively high new build price change figure may be at odds with other indices due to the effect of Help to Buy and the distribution of new build activity in this region. The South East, South West, East Midlands and East Anglia and Greater London still show the strongest growth rates and these regions neatly define the South of the country. But all regions are now in positive territory and the potential for growth, when viewed through the window of average property prices relative to earnings, lies in the North of the country.